Tooth loss doesn’t just impact a person’s self-image, but their oral and overall health as well. It can limit a person’s diet choices so much that they develop nutritional problems, which can drastically harm someone’s quality of life and even shorten it by over a decade. Fortunately, dentistry already has a proven solution to this problem: dentures. There are several varieties of dentures we offer that can help reverse varying degrees of tooth loss, such as partial dentures, full dentures, and even implant-supported dentures. Which option is best for you? Read on below to learn more. Why Choose Glow Family Dental for Removable Dentures? Full and partial dentures usually consist of prosthetic teeth attached to a gum-colored base that is made of a plastic resin. This base is designed to fit in the mouth and over the gums using either natural suction or small metal clasps that hold onto the neighboring teeth. These prosthetics are intended to look completely natural and blend with the rest of a patient’s smile. Getting the right fit and look is essential to the long-term success of a denture, which is why Dr. Martinez always takes his time when designing one for a patient. Because these dentures can be easily taken out of the mouth, this allows for easy cleaning of both the prosthetic as well as the gum tissues themselves. Over time, as a patient’s jawbone and gum line change shape, the dentures will need to be slightly refitted. Adjusting to new dentures typically takes a couple of weeks, but exercises like reading out loud, singing, and temporarily switching to a soft food diet can make this process much more efficient and comfortable. As their name indicates, immediate dentures are usually a temporary means of helping a patient transition to a permanent denture. These are placed immediately after the rest of the natural teeth have been extracted. They don’t fit as well as a permanent denture, but they do ensure that a patient has a complete set of teeth right away. These dentures are carefully crafted to look as much like your natural teeth as possible, and they should be able to function properly in your mouth for a very long time. They will be designed based on a number of scans, X-rays, and impressions of your mouth to ensure the perfect look and fit. To give a full denture more stability, it’s possible for one to be anchored directly to the jawbone using multiple dental implants. Upper dentures typically need more implants than lower ones due to the upper jaw having less bone density. Many of our patients have said that these dentures feel like the closest thing to their natural teeth. 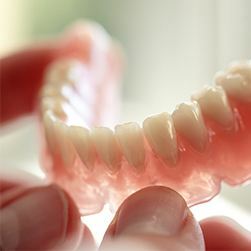 These are relatively inexpensive and removable plastic dentures that serve as a temporary replacement while a patient's final dentures are being made. Once a patient’s mouth has healed from any extractions, they’re then ready to receive their permanent denture. These well-constructed, metal-based removable dentures are much lighter and have a better fit than the plastic ones we touched on above. They are a little more expensive, but they provide better function and aesthetics, and they are also a more affordable option than dental implants or fixed bridgework. Making a denture for a patient requires a blend of both art and science. First, an impression must be taken of the mouth and jaws, and this will be used to design how the denture will actually fit. We’ll create this impression and then send it to one of our partner dental labs. There, a technician will choose among many different sizes and shapes of prosthetic teeth to recreate a functional and natural-looking smile. 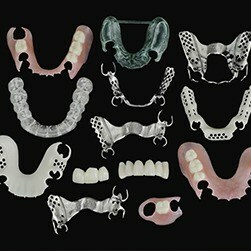 A patient will have the chance to try on multiple prototypes before their permanent dentures are made and placed. Another important part of this process is ensuring the proper balance of the bite. A denture may look great, but if the rows of teeth don’t come together correctly, then speaking and eating will be quite difficult. 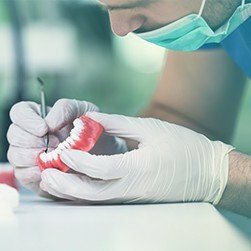 When placing a denture for the first time, Dr. Martinez will check its form and function to make sure that a patient gets everything they need. It usually takes a patient a couple of weeks to adjust to wearing their denture--speaking and eating will not feel “normal” the very first day. 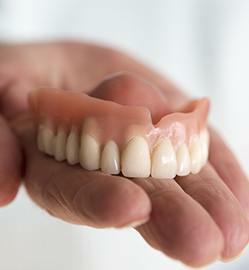 A patient will need to practice using their denture in order to make it feel more comfortable. Things like reading out loud and singing in the shower can help make speaking start to feel like it should. We’ll recommend that a patient temporarily switch to a soft food diet as well until they become more adept at chewing with their dentures. Over time, they can slowly transition to their normal diet. Are you ready to have a full smile again? Dentures have helped patients replace multiple missing teeth for generations, and now, they are better than ever before. To learn more about your denture options with us or schedule an appointment, contact Glow Family Dental today.